Gifts can bring an amazing smile to anybody’s face. And when it is about someone close to you, you want even bigger smile right? Save the date handkerchiefs can be a great way to let your loved ones know to save the date while giving them a little keepsake at the same time. Here are a few steps which will help you create a beautiful save the date handkerchiefs. Firstly, pick a cotton handkerchief. 100% cotton women’s handkerchiefs come in different styles. 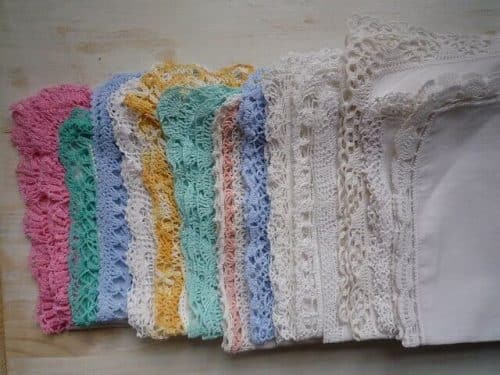 You can pick basic or colored handkerchiefs. They come in different floral prints like rose, lily, lavender etc. You can also consider white cotton bridal handkerchiefs trimmed in wide, white lace and a blue satin bow. Wash and iron these feminine handkerchiefs for the best results. Pick out your stamp pad. Now put the handkerchief on a hard surface and place the inked stamp on it. Apply even pressure and gently lift the stamp off your handkerchief. Now you should be able to see a beautiful pattern printed on the handkerchief. Now take a thick piece of plain or subtle colored paper and write whatever you want to. You can slide this card or note into the handkerchief. You can also tie them together like a present with the desired ribbon. Pick a square envelope and put the handkerchief into it. Make sure that the envelope is sealed properly so that the handkerchief doesn’t fall off. You can use all these steps to make some elegant brown and cream wedding invitations as well. You can select a cream handkerchief and brown envelope or vice-a-versa. This combination brings in the warmth of English countryside style. You can choose some beautifully crafted brown and ivory Vintage invitation kits if you don’t have much time to make the invitations. These kits help you create striking cards with attractive floral, brown and cream vine designs.